We have developed and introduced a comprehensive system of quality management, which was certified with ISO 9001:2000 in 2005 by the Slovenian Institute of Quality and Metrology (SIQ). The system of quality management, which ensures the proper regulation of business processes and compliance with the relevant legislation, standards and internal regulations and instructions, is regularly revised and improved. The constant improvement in the effectiveness of the processes and functioning of the system, which is tied into the daily activity of each individual employee and the company as a whole, has also been confirmed in Januarym2010, when we were awarded the ISO 9001:2008 certificate, which is an update of ISO 9001:2000 certificate. In our work, we have a responsible attitude to the environment by striving to prevent pollution to the greatest degree possible while managing costs and making use of resources with efficiency. We respect and pay attention to the expectations of our business partners, owner and other members of the public. 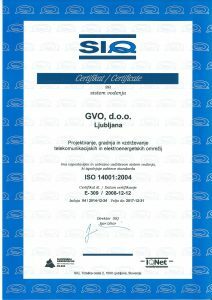 Our comprehensive management of the environmental aspects of our activity has been confirmed bh the Slovenian Institute of Quality and Metrology (SIQ), which has issued us with the ISO 14001:2004 certificate in December 2008. As proof of our professional attitude and qualification, we have also received some other certificates in the last few years. As well as the Edison certificate, which improves our qualification to perform measurements, installation, maintenance and servicing relating to electrical and other installations, lightning protection systems, machines, mechanical equipment and devices, we also received the SIST EN 60079-14:2009 and SIST EN 60079-17:2008 certificates, which demonstrates our qualification for the installation and maintenance of electrical equipment in aras with explosive atmospheres (ex. Gas stations).